The #CACHEBelfast event caught our eye on Twitter. It turns out there was a duplicate event in Derry. It was billed as a celebration of the creative industries. We were introduced to the concept by Clare Magill from Noribic, who is leading the initiative to develop a representative body, one that – I understand – will gather, galvinise, lobby, inspire and enliven the Creative Industries, a notoriously difficult to define, and even harder to find, group. So Who or What Exactly Is The Creative Industries? Why Don’t People See Themselves as Creative? My best guess, coming on the back of many discussions with other professionals at networking events, and over tea and buns, is simply that many creative people do not see themselves as creative. They’re used to being put down, or told to calm down, or told it won’t work, or told there’s no money, or told isn’t that what so and so is doing?, or told they should do something else. Or, told they need to go get a proper job. They’re used to seeing others – painters and musicians perhaps – as truly creative. They’re missing a crucial point. My not terribly worked out theory is just as simple. You’re creative if you make it happen. The word itself means to make something from nothing. If there is a not quite perfect shape where there used to be a pile of clay, that’s creative. If there is a class full of eager preteen coders where there used to be TV addicts, that’s creative. If there is a long-form article where there used to be news of the latest celebrity’s wardrobe malfunction, that’s creative. If there is a fledgling network still trying to define itself, then find and convince potential members, where there used to be none, that’s creative! 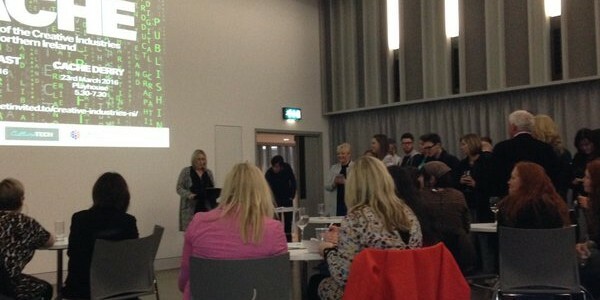 I look forward to the development of this network for the Creative Industries in Northern Ireland.